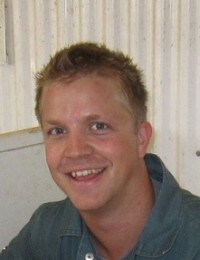 Curtis was born in 1983 and grew up on a mixed farm (grain and livestock) west of Conquest, SK. This is where his life-long passion for agriculture and livestock developed. He completed a Bachelor’s degree in Agriculture (majoring in Animal Science) from the University of Saskatchewan in the spring of 2005. That fall he began studying at the Western College of Veterinary Medicine. After obtaining his DVM in 2009, Curtis moved to Balgonie, SK and worked in a mixed practice (livestock and companion animal) for two years. In 2011, an opportunity to focus exclusively on livestock production/preventative medicine brought Curtis to Warman Veterinary Services. Involvement in the dairy, beef, and swine industries has led to Curtis becoming a member in the American Association of Bovine Practitioners (AABP), the Western Canadian Association of Bovine Practitioners (WCABP), and the Western Canadian Association of Swine Veterinarians (WCASV). While his interests are varied, from calf/piglet health to creating vaccination/treatment protocols, he really enjoys discussing individual farm goals and developing the framework to help achieve those goals. The most fulfilling aspect of the job is the opportunity to develop great relationships with his clients. Outside of work Curtis enjoys spending his time outdoors with his wife Niki, daughters Sofie, Ella, and Drew, and son Hadley. He loves to attend the children’s sports/activities and tries to get involved with coaching as often as possible. When able, Curtis travels back to Conquest where his parents still raise beef cattle.